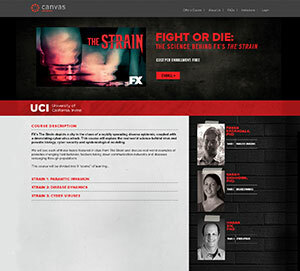 First zombies, now vampires: After creating a popular MOOC in 2013 on the science, math and health concepts behind the TV series "The Walking Dead," the University of California, Irvine has partnered with Instructure and cable channel FX to launch "Fight or Die: The Science Behind FX's 'The Strain,'" a massive open online course inspired by themes from the TV vampire drama. The four-week course will be offered on Instructure's Canvas Network platform, taught by a multidisciplinary team of UC Irvine faculty: Pavan Kadandale, molecular biology and biochemistry; Hadar Ziv, information and computer science; and Sarah Eichhorn, physical sciences. Course modules are designed to provide a practical and theoretical understanding of parasites, cyber attacks and disease dynamics. The hope is that the combination of pop culture and serious academic concepts will result in increased student engagement. "This course will provide both teachers and students a unique opportunity to examine academic principles in a non-traditional setting," said Eichhorn in a press release. "It's not every day we get to structure a course against the backdrop of a rapidly spreading disease epidemic and devastating cyber attack. Using clips from 'The Strain,' our course will let students take a closer look at the science behind the popular TV series, all while discussing real-world examples of parasites changing host behavior, hackers taking down communication networks and diseases rampaging through populations." In addition, course participants will apply concepts from the course to create and share their own original content. Enrollment is currently available for free at the Canvas Network site. The first course module will begin this summer, three weeks before the Season 2 premiere of "The Strain."